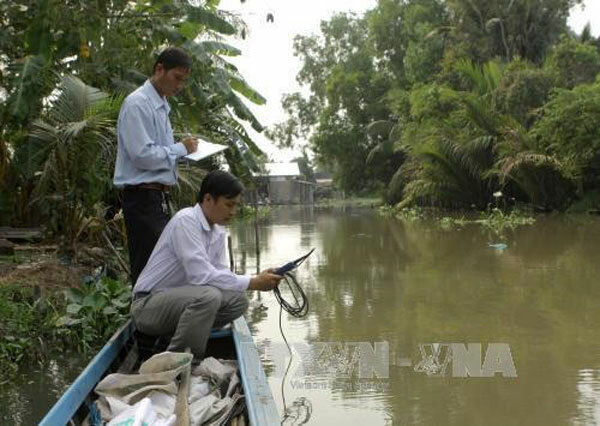 VietNamNet Bridge – The Southern Institute of Water Resources Research has asked farmers and irrigation management units in the Cuu Long (Mekong) Delta region to store water in ponds and canals for the dry season this year. Salinity in the Vam Co River has reached 1.73 per cent, an increase of 0.45 per cent compared to the same period last year. Salinity in Cai Lon River has reached 2.53 per cent, an increase of 0.5 per cent compared to the same period last year. A report from the institute shows that, from the beginning of the dry season, saline intrusion had penetrated 58km inland in the western coastal area and the Cai Lon River area, an increase of 6km compared to the same period last year. The institute forecasts that from now to the end of April, water sources in the area more than 30km from the sea and near the mouth of the Cuu Long River will be sufficient for the upcoming summer-autumn crop. For the Vam Co River area, saline intrusion may appear more often and may last until May, according to the institute. The southern region has entered the dry season, with the peak hot weather occurring from March to May. According to the National Centre for Hydro-Meteorology Forecasting, saltwater intrusion this year is expected to be worse than last year.